Today in the Netherlands, one of the most secular countries in Europe, there are more than 2 million people that practice yoga, and almost 60,000 Buddhists. Moreover, there are millions seeking peace of mind and take Mindful courses, which is often reimbused by health insurance companies. 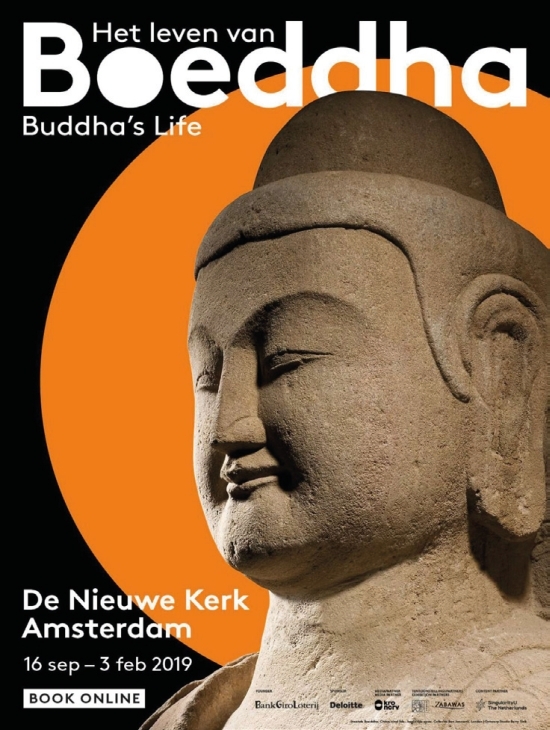 In the modern 24/7 online economy, having peace of mind, and living in the present moment has becoming a luxury, and the title of De Nieuwe Kerk’s exhibition “Buddha’s Life. Path to the Present” is a well chosen one. The exhibition, which was officially opened last month by the Dalai Lama, tells the compelling story of the life of Siddhartha Gautama, ‘Buddha’ who was born a wealthy prince in the fifth century B.C. and at the age of 29 renounced his worldy possessions and devoted the rest of his life to spirituality. The exhibition takes visitors along Buddha’s five life phases: birth, insight, enlightenment, first discourse, and death. In many ways, the struggles in Buddha’s life course are not much different than most in the twenty-first century who are looking for purpose and spirituality. For the exhibition, co-curator and designer Siebe Tettero (also a practicing Buddhist for more than 20 years) selected 50 objects from various public and private collections from around the world. They range from numerous Buddha statues that were created to represent the spiritual leader in different parts of the world where Buddhism is a predominate faith. One of the oldest is a Relief panel from the second century A.D, on loan from the Victoria and Albert Museum in London. The work, on display in Buddha’s phase of life ‘Insight’, shows Buddha’s departure from his material life as a prince as he begins his journey for spirituality. The most mind-stilling objects are placed at the entrance of the exhibition and include a stuffed deer decorated with small glass globes standing under a giant, lifesize tree. Ai Weiwei’s Tree (2010), constructed from a real tree and held together with steel bolts after it was cut down in China to make way an apartment building, symbolizes the tree that Siddhartha Gautama, the young Buddha first found enlightenment. And the stuffed deer, PixCell-Deer#51 which the artist, Koehi Nawa, purchased at an auction, represents life’s transience and it’s beauty. The two symbolizes man’s struggle with duality in life. The light from the windows in the church’s transept shining diagonally down, transcends an overwhelming feeling serenity, and feeling of being in the present moment. The exhibition, is part of de Nieuwe Kerk’s series of exhibitions about exemplary lives and inspiring historical figures. Previous exhibitions included Gandhi, Martin Luther King, and Nelson Mandela. The exh i b i t i o n runs until 3 February 2019, and includes meditation sessions in the weekends, and various workshops and other activties.